"This is a garden, not a prison." On North Chester Street near Clifton Park, a Baltimore Police officer watches the hot corner. BALTIMORE — On North Chester Street near Clifton Park, a Baltimore Police officer watches the hot corner. Three people were shot here Wednesday night, two died. On the spot, it's still obvious where the pavement was hosed down; a bullet fragment rests on the pavement, seemingly overlooked. But from behind a mostly vacant row, the distant sound of tilling soil replaces gunfire late Friday morning. It's spring and 80-year-old Lewis Sharpe is getting ready to plant his Miracle Garden which he has been tending to since 1988. He gives his food away to the neighbors that need it and even wants to build a new playground on a recently cleared lot for the children here. Sharpe still hasn't heard from the city on his plan, but people know he is trying; a passerby told us he was a hero. 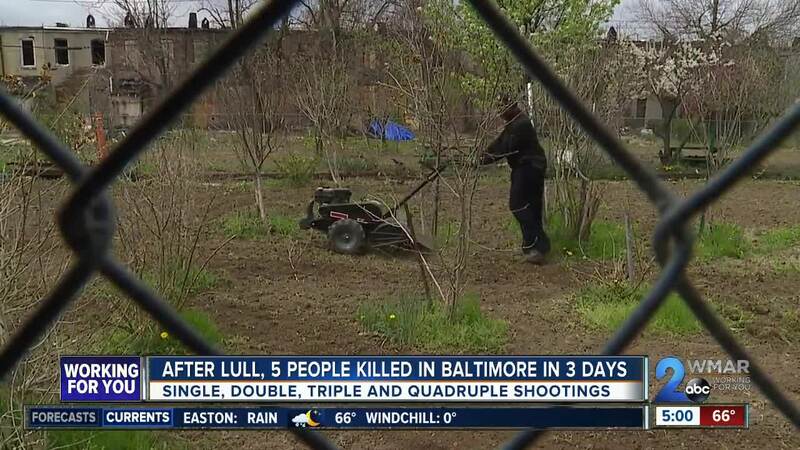 The 80 year old tends to his garden every day in plain sight of drug deals and now a triple shooting. He hopes it can get better, planting his seeds of change, but as we saw Wednesday night, the violence and drugs persist. “I worry about somebody gonna get hurt because if it wasn't for what was going on around here, I wouldn’t even have this fence up here. This is a garden, not a prison,” Sharpe said. The frustration is in Northwest Baltimore as well where there was a quadruple shooting in Parkwood. Here again, there were more police standing watch after a late morning shootout yesterday that wounded three and killed one. Residents are upset the relative early April calm was shattered by so many bullets.